It was the idea of creating a homepage where all users could freely upload art that fascinated Anders Cederholm, already when he was a sophomore. For Anders, it was always about running his own project. ”It was an exciting market, and people have no idea how easy it is to buy art straight from the artist and get the personal story behind the work” he tells me. Today, the idea has become a business that’s already two years in and has developed at a mind-blowing pace. While studying Business Development Engineering in Herning, Anders happened to find exactly the right team with the skills to develop the concept of a democratic platform for art. ”We had all just moved into our own apartments, so we could relate to the problem of not finding the right things for the walls”, Anders laughs. After two weeks, there was a Grundfos Challenge at school, and Anders knew that he needed the best team. ”I knew that Kim Døfler Sand Laursen had won every single robot contest and practically everything to do with Lego tech. At the same time, he has a background as ski guide and is ridiculously extroverted”, Anders notes, continuing immediately, ”Mikkel Steen had that sort of pensive calmness, and everything he said was smart”. Even though the Danish entrepreneur guys had known each other but a few weeks, many got the impression that they had collaborated for years. From simply being a trading page for art, Artboost is now well on its way to becoming a kind of ecosystem for all things art. With 1514 users from more than 35 different countries and 624 member artists, Artboost is first and foremost a social media. Here you can nurse your art obsession or develop your own subjective interest in art without others judging what is esthetically right or wrong. By studying Business Development Engineering, the Artboost guys obtained the necessary tools for starting their own company. ”We learn a little bit about everything”, as Mikkel Steen puts it. Even so, no textbook beats real-life experience, and the process of developing Artboost has been an education onto itself. And it has been worth gold, because as recognized by Anders Cederholm, there are some different dynamics in the real world that you can’t get out of a book. He is from Egå outside of Aarhus, and he was raised in a very mercantile home, where just about everyone was an entrepreneur. When he was 12, however, his mom found a new boyfriend who had his own company, and this kick-started Anders’ interest in entrepreneurship. Therefore, he started early on doing his own thing with small, creative inventions. ”From the beginning, I was attracted to delineating my own project”, he clarifies enthusiastically. As an entrepreneur, you also naturally become very adaptive in the way you handle knowledge, because you are always having to learn things from scratch. You can’t just hire people to do things for you” he continues energetically. Whereas in continuation school, he would buy things and resell them, in business college, he tried to resell a bottle opener that fit in a wallet to a large clothing chain for men. ”It was pretty cute, but nothing much happened then”, he admits. ”I probably didn’t have the credibility back then”. Mikkel Steen grew up in Slagballe, out at the back of beyond, and having completed upper secondary school at Tørring Gymnasium, he has a different, well-thought-out and theoretical approach to things. He soon discovered that a routine type job with no options for innovating was very unsatisfying. ”I like to strike out on my own and create things for myself”, he says. Already at the age of 12, Mikkel started his own role playing club that reached 120 active members and had its own board and was subsidized by the municipality. ”The board consisted of 12- to 13-year-old boys, and we were not at all mature enough to take on that responsibility”, Mikkel laughs. That wouldn’t be the last time, he learned, how easy it is to combine business and pleasure. At 16, he started his own publishing company with his dad, where they create interactive learning materials that are freely accessible on the internet. ”We make money when people print out our work sheets. Still, when it came right down to it, working with my dad wasn’t quite enough. I wanted to follow my own path and do my own thing”, Mikkel says. As an entrepreneur, you also naturally become very adaptive in the way you handle knowledge, because you are always having to learn things from scratch. If you ask the Artboost team what their greatest motivation behind the company is, they answer to a man that it’s about breaking down the conventional barriers that previously hampered the free distribution of artwork between artist and buyer. ”I have always been attracted to the art world, but a little intimidated at the same time. It’s like you had to be somebody to get in”, Mikkel says. And that sense of awe is exactly what Artboost would like to eliminate. Therefore, the concept behind the company is to demystify art and make it accessible to the masses. ”Until now, it has been a very unreasonable market for the artist, where it is hard to break through. In order to be considered to be somebody, you have to have been shown in a curated exhibition, and in order to have been invited to a curated exhibition, you either have to know somebody or have been there before,” Mikkel says. At Artboost, there is no censorship, and the content is not curated. This means that anyone can create a profile, both as user and artist, and therefore, you can consider it a kind of online gallery that’s open to everyone, day and night. Instead of the different artists having each their homepage, everything is collected at Artboost, making it much easier and more inspiring for potential customers to navigate. ” For many artists, the process is what’s important, and they don’t at all have that sales drive that’s necessary to sell their art, when it’s finally finished,” Anders elaborates. ”This is where we come into the picture and help facilitate the deal, so the artists can focus on creating.” In other words, Artboost starts to challenge the thought that art must flourish across exclusive forums in order to be interesting. ”If you ask many young people, they would tell you that they don’t have any art at home. But if you ask them if they have stuff hanging on the walls, they almost all say yes,” Anders notes. ”That’s because it simply isn’t categorized as art.” But what is art? Art is precisely that subjective and abstract entity that everyone relates to differently and has a right to enjoy. But what is art? Art is precisely that subjective and abstract entity that everyone relates to differently and has a right to enjoy. 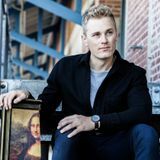 The Artboost team did not come out of the art world per se, but this gives them a huge advantage, according to Mikkel. ”We can follow the perspective of the buyer and explore what it takes for a person who hasn’t previously developed an esthetic taste to want to browse around the homepage,” he explains. It is precisely the intent of Artboost to encourage users to engage with art and develop their own taste. ”Obviously, art is something very subjective, and we would like to challenge people to devote themselves to it like you would a hobby. Before, a lot of our buyers would have to go down to Walmart and select the best alternative among 20 mass-produced pieces,” Mikkel notes. At Artboost, you find a wide selection, both from Danish and international artists, but the content isn’t carefully selected and combined the way you see with conventional galleries. Here, everyone has the option of uploading art, and when it comes right down to it, the individual user evaluates what is good and bad art. In principle, a buy from Artboost works just like normal net shopping, but there is the extra step of always having to request buying a piece of art from the artist. The individual artist creates his or her own shipping terms and otherwise edits the content on his or her own page. ”We can help by generating some traffic for the artists by encouraging our users to contact them directly”, Anders says. The homepage is filled with interactive options, such as being able to create your own wall with decorative ideas for certain rooms. After this, you can invite any colleagues or family members as co-curators. Furthermore, as a user you can follow artists, create your own gallery, read news from various fashion bloggers and discuss artwork with the artists behind them. ”We have seen a general democratization in other industries, such as the music industry. So we thought, why not turn an environment on it’s head that’s been known to be very conservative and aristocratic”, Mikkel explains. So much has happened for the Artboost team lately, that they sometimes need to stop, take a breath, and think clearly. The next little while will be spent zooming out and strategizing where the company should be headed. There has been no lack of media attention, and the innovative project has received recognition and has opened many doors. ”We’ve been bounced around among so many challenging constellations of individuals that think the project is exciting. All the new connections we’ve suddenly made have been awesome,” says a happy Anders. On the other hand, it has been a lengthy process, and the guys have far from arrived. They need to generate more traffic on the homepage, and it’s been a slow start. ”Obviously, it’s challenging to keep convincing ourselves that it’s the right thing we’re doing, even if we have yet to make any money”, Mikkel notes. He points out with a half-smile that sooner or later they will need to get paid as well. However, the Artboost team has lots of drive and look forward to launching the many new features that will make the homepage and even more extensive social platform in the near future.